353 North Clark prides itself on being a uniquely sophisticated place to work, and the property managers partnered with TurningArt to further distinguish their high-rise in this bustling Chicago business hub with eye-popping artwork that will rotate throughout the year. "The team at 353 North Clark is committed to providing tenants an extraordinary level of service while elevating the office experience. 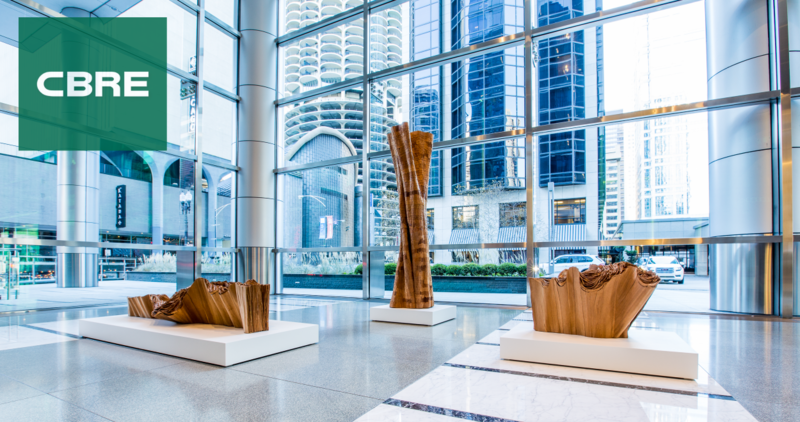 Showcasing the vibrant culture of Chicago through rotating exhibitions by established local artists is an important part of our unique service deliverable. On a semi-annual basis, TurningArt will transform our lobby space with sophisticated and engaging works by best in class local sculptors. TurningArt even went beyond the art to provide everything from dedicated pedestals, custom designed catalog brochures, and professional photography to enhance the experience."